The full moon will rise tonight over the east coast at 6:55 PM EDT. It is the third consecutive super moon and the 5th this year. We in astronomy used to call them perigean new moons or perigean full moons, that is, new or full moons closely coinciding with perigee – the moon’s closest point to Earth in its orbit. But, like almost everyone else, now we enjoy calling them supermoons. The name supermoon was coined by an astrologer, Richard Nolle, over 30 years ago. It was popularized and came to be the accepted term for most people only in the past few years. 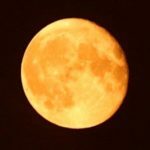 Are supermoons hype? In our opinion … gosh, no, just modern folklore. And they can cause real physical effects, such as larger-than-usual tides. The year 2014 has a total of five supermoons. They are the two new moons of January, and the full moons of July, August and September. It’s also the Harvest Moon which is the full moon closest to the autumnal equinox which falls (punny) on September 22 this year. The super Harvest Moon and Mid-Autumn Festival of September 8-9 are early in 2014, but September equinox isn’t until September 23 at 2:29 UTC. Although the equinox happens at the same moment worldwide, the clock times vary by time zone. In the U.S. this equinox comes on September 22 at 10:29 p.m. EDT, 9:29 p.m. CDT, 8:29 p.m. MDT or 7:29 p.m. PDT. In the Northern Hemisphere, the sun is rising later now, and nightfall comes sooner. This is our autumn equinox, when the days are getting shorter in the Northern Hemisphere. At this equinox, day and night are approximately equal in length. For us in the Northern Hemisphere, people are enjoying the cooler days of autumn even as preparations for winter are underway. South of the equator, spring begins. It happens on September 9 at 1:38 Universal Time. In North America, the crest of the moon’s full phase comes on September 8, at 9:38 p.m. EDT, 8:38 p.m CDT, 7:38 p.m. MDT or 6:38 p.m. PDT. So the night of September 8-9 has the brightest, fullest moon for the Americas. Meanwhile, for the most of Asia, the moon turns precisely full during the daylight hours on September 9. For all of us, by the night of September 9-10, the moon will be waning. In fact, September 8, 2014 is the night of the Mid-Autumn Festival in Asia, which is linked to this full moon. For modern Pagans and Wiccans, this moon marks the start of the second harvest which culminates on the Autumnal Equinox. The third and final harvest then begins as the nights are longer than the days and we start to prepare in earnest for winter. Samhein, or Halloween, marks the final harvest celebration with bond fires, feasts and music marking the passing of another year and the beginning of winter. Wherever you are tonight, step outside, stand barefoot on the earth, reach up to touch the moon and breath. The shower is visible from mid-July each year, with the peak in activity between 9 and 14 August, depending on the particular location of the stream. During the peak, the rate of meteors reaches 60 or more per hour. They can be seen all across the sky; but, because of the path of Swift-Tuttle’s orbit, Perseids are primarily visible in the northern hemisphere. As with many meteor showers, the visible rate is greatest in the pre-dawn hours, since the side of the Earth nearest to turning into the sun scoops up more meteors as the Earth moves through space. Most Perseids disappear while at heights above 80 kilometres (50 mi). Your best views are between midnight and a few hours before sunrise (around 6:30 a.m.) as Earth rotates into the stream of debris left behind by comet 109P/Swift-Tuttle. The view improves as the moon sets around 3 a.m. Wednesday morning. The moon will set about an hour later each subsequent day. Beginning Monday, your best chances are at a more family friendly evening time from shortly after sunset (around 8:45 p.m.) through moonrise about an hour later. 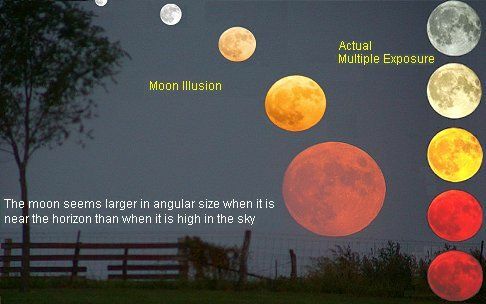 The moon also rises about an hour later each subsequent evening, giving more opportunity to see meteors before the nearly full moon washes out the sky. Also take a moment to look low on the southwest horizon for Saturn and just below and to the right for Mars. It’s time to stand still a moment, look up, and breathe. Saturday night at 11:34 PM EDT the moon will reach its perigee, its closest point to Earth in its elliptical orbit and one minute later it become full. According to NASA, 14 percent bigger and 30 percent brighter than the other full moons of 2012. Saturday also marks the midpoint of spring in the Northern Hemisphere. The exact moment between the March equinox and the June solstice occurs at 10:11 a.m. EDT May 5. High tide will be higher and low tide will be lower. The only worry there is if Manhattan slides away into the Atlantic but Long Island would have to go first. But whatever you’re doing, take time to go out side, stand still a moment to look up at the night sky and breathe.